A clothes dryer with no heat is a problem. What causes a dryer not heating? A part in the electric dryer may be faulty and needs to be replaced. Faulty parts in an electric dryer will cause the dryer to stop heating. If the dryer does not heat the heating element, the dryer stops drying the clothing. 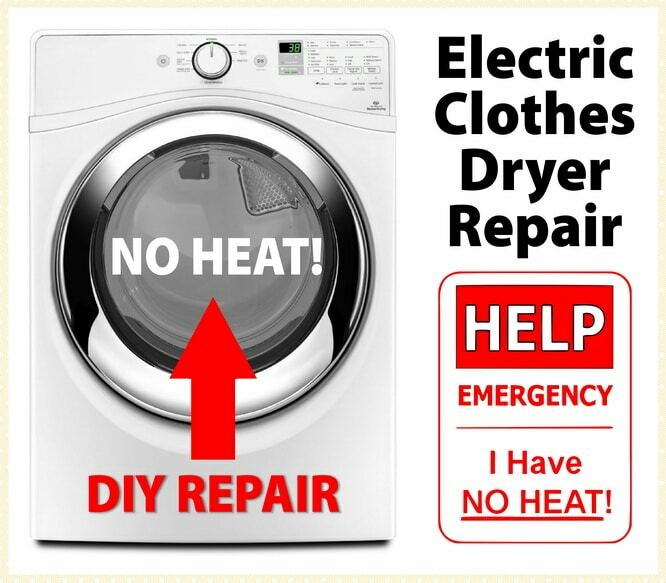 Here are simple steps to fix an electric dryer with NO HEAT. The troubleshooting methods on this page will work with all dryers including GE, Kenmore, Maytag, Samsung, and Whirlpool electric dryers. 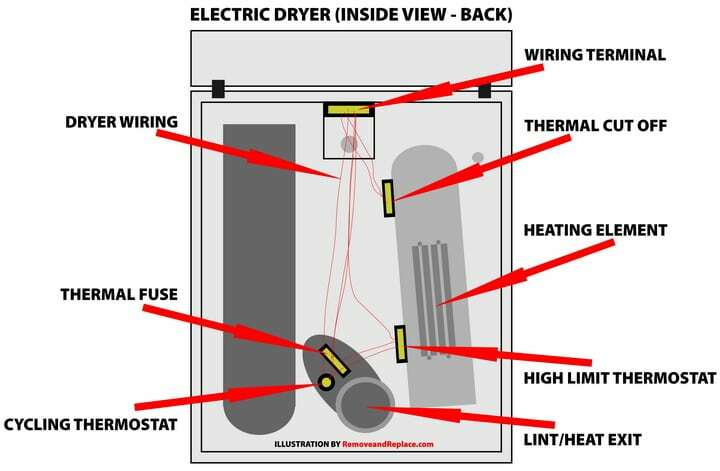 Below we will explain how to fix an electric dryer the easiest way. It is a simple process of finding out which part in the dryer is causing the problem. Use a cheap multimeter to troubleshoot and find which part is causing the dryer to not heat. Once you know the faulty part, buy an inexpensive dryer replacement part online and install it yourself. Save hundreds of dollars and do it yourself. All the information you need is below with videos included. 1 – Unplug dryer from wall or flip wall breaker to remove power to dryer. 2 – Remove the rear panel/front panel on dryer. HINT: Depending on the model number of your dryer, you will need to either take the front panel off or the back panel off to access the parts for testing/troubleshooting. OLDER STYLE DRYERS – Remove back panel to access parts. NEWER STYLE DRYERS – Remove front panel to access parts. 3 – Locate the components listed below. 4 – Use the dryer parts location chart to assist you like the one below. This safety fuse can blow and therefore no heat in dryer. Cut off fuse can blow and therefore no heat in dryer. Temperature monitoring thermostat can blow and therefore no heat in dryer. Temperature thermostat can blow and therefore no heat in dryer. Heating component creates the heat in your dryer – if faulty, the dryer will not heat up. When testing parts with a meter, remove them from the wiring first! Isolate the part to test it properly. When testing for continuity, a thermostat, fuse, or element should read 0 OHMS of resistance when testing continuity. If you have an audible meter, it will produce a sound. This means the part is working properly. If the part is faulty or blown, the meter will not change, which means the part is faulty and needs to be removed and replaced. If the electric dryer does not heat after testing and confirming all parts above are checked to be good, you will need to troubleshoot the other parts in the electric dryer. When searching for parts for an electric dryer you will need the model number of your dryer. Find your dryer model number on a plate attached to the dryer or in the dryer owner’s manual. Certain dryer parts can look the same, be sure to always buy parts that match your specific model number dryer. 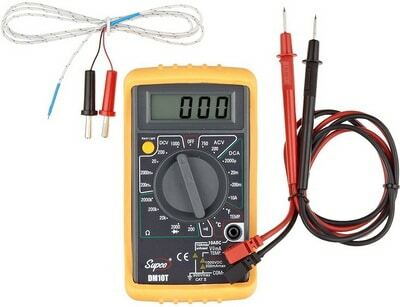 To repair the dryer yourself, you will need a good but affordable digital multimeter. The one below was chosen by us. A meter like the one below will make it easy for you to test all the parts in your dryer and make it easy to repair. Click on the meter to see details. It is the meter we use when performing appliance service calls and other home maintenance. If you do not know how to use a meter, see the videos further down to understand how easy it is to use a meter and repair things in your home. NOTE: The troubleshooting methods on this page will work with all dryers including GE, Kenmore, Maytag, Samsung, and Whirlpool electric dryers. When troubleshooting the dryer not heating up issue, if you cannot get the electric dryer to heat and dry your clothing properly, leave a comment below with your dryer problem and the dryer model number and we can troubleshoot the issue.